Planning a move to a foreign country you don’t precisely know is not an easy task. The pre-departure steps of learning the mentality, processes and overall general information on the country can be very intimidating. Vietnam is one of those countries, with an attractive appeal, but in order to better adapt to a new life in Vietnam, there is much to learn before moving there. With Just Landed’s newest expatriate guide on Vietnam, you can find the boost you need! The Vietnam country guide provides information every expat should know, with relevant topics such as obtaining a visa and work permit, renting and buying housing, finances and culture, among others. All subjects are addressed to match a step of your “Going Vietnamese” life! Vietnam is a rich country in terms of beauty, history and opportunities for the future. Even though it has been known for its tough political past, it is now becoming a more appealing expat destination. This spot in Southeast Asia offers any foreigner the opportunity to discover a serene culture in a world where the key word for behaving is wisdom, through spiritual life influenced by Confucianism. 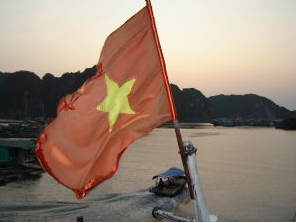 Yet also in Vietnam, you can find cities like Hanoi or Ho Chi Minh City, which are lively and developing rapidly. In these bustling cities, you can try Vietnamese cuisine, which proves to be innovative and tasty, browse local artisan products at an outdoor market or you may even find yourself at the local karaoke bar, singing a song you may have never heard before. The Just Landed country guide on Vietnam will help eliminate culture shock and doubts you may have during the expatriation process. We make it a priority to inform you on any topics which may be unclear, so do not hesitate to interact with us in need! Welcome to Vietnam! Chào mừng bạn đến với Việt Nam! Previous story Fancy going home for the weekend?